Auditing your PPC campaigns is a necessary part of the job. You need to ensure that your content works properly and is maximized for efficiency. However, it’s hard to keep everything that you need organized and some things might get lost in the mix. The free PPC Audit Checklist is the best way to make sure your PPC campaigns are up to snuff when it comes to the marketing world. There are so many things that can go wrong with ad campaigns that are why this helpful checklist is available to you whenever you need. Just go through the list and make sure you’ve met all the requirements. PPC is really that easy with this free checklist template. Start by scrolling down this page and following the link we have provided for you. 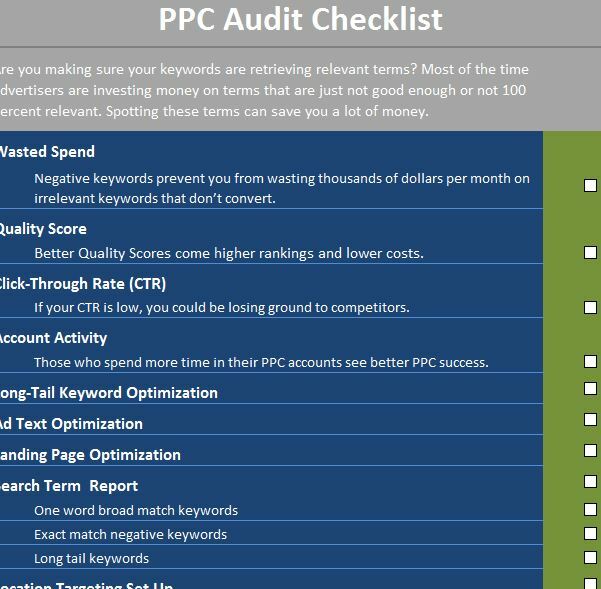 This will download the free PPC Audit Checklist file directly to your computer, no fees or sign-ups required. Now, take a look at the list of items that are on this simple sheet. The topics are listed above with a title and the items below in a smaller font are related to that category. If you want to add or change any of the pre-written items on the list, just click the cell and start typing something new. The template will automatically update the content to feature your new item. When you’re ready to audit your campaign before you actually implement, you will go through your list of items and check them off as you complete each task. If one of the items does not apply to your material, just skip it and move to the next task. With this PPC Audit Checklist, you can see how easy it is to avoid simple mistakes that might otherwise be overlooked and even try to improve as you double check your work!